I’m not a fan of Manny Ramirez. I will always firmly believe that his unquestionable use of PEDS had a dramatic impact on his numbers, especially during his peak seasons in Boston. The extortion and bullying techniques he used to escape his Red Sox contract and force his trade to the Dodgers was both classless and overtly greedy. But regardless of how you feel about this guy, there were some absolutely priceless Manny-being-Manny moments during his crazy career and every time I see them replayed, I absolutely miss seeing this guy play Major League Baseball. Enjoy! 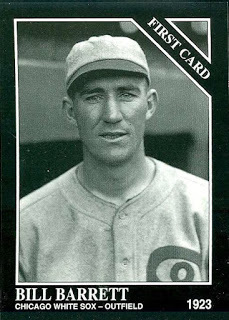 Bill Barrett was the starting right fielder on the very bad Red Sox team that finished last in the 1929 American League standings with a 58-96 record. Born across the Charles River in Cambridge, it took “Whispering Bill” eight years after his big league debut with the A’s to make his way back home and play for Boston. He spent most of those eight years with the White Sox, where he established reputations for being one of baseball’s most versatile players and loudest and most annoying bench jockeys (which is how his sarcastic nickname emanated) During his time in the Windy City, he played all nine positions on the field and probably wasn’t too happy in any of them because, based on my research, it also appears as if he was also a chronic complainer. In fact, this guy was upset because first his team and then the Commissioner’s office refused to permit him to start a career as a professional boxer while he was in the big leagues. During his one season as a starter in Beantown, Barrett played in 111 games and averaged a very soft .270, scoring 57 runs and driving in just 35. He was traded to the Senators early on in the 1930 season for outfielder Earl Webb, which turned out to be a great deal for the Red Sox because Barrett played just six games for Washington and then his big league career ended. Webb had two great seasons as Boston’s regular right fielder and still holds the franchise record for most doubles in a season, with 67. When his playing days were over, Barrett returned to Cambridge, where he died in 1951 at the age of 50. There are 38 men currently in the Hall of Fame, who at one point in their careers, played or managed for the Boston Red Sox. Only fourteen of those men established a significant portion of their Hall of Fame credentials while wearing the Red Sox uniform. The rest spent relatively small pieces of their baseball lives with Boston, usually at the very beginning or end of their distinguished careers. In my humble opinion, Al Simmons was one of the greatest all-around players in baseball history. A native of Milwaukee, he joined Connie Mack’s Athletics in 1924 and drove in 1,157 runs for that team during the first nine years of his career and averaged close to .350 doing it. He had outstanding power, was a great baserunner and had a rifle of an arm that helped make him one of the game’s all-time great defensive left-fielders. He was famous for his open batting stance, in which the toes of his left-foot pointed at third base. To this day, little league coaches warn young hitters to avoid this technique by shouting “You’re stepping in the bucket, move that front foot closer to the plate!” That’s how Simmons got his nickname of “Bucketfoot Al.” He was not exactly a friendly guy on or off the field. I’ve read that he was cocky, very tough on young teammates and drank way too much. But for a dozen seasons in the twenties and thirties, he was as good as any baseball player in the game and he helped Connie Mack’s A’s beat out the mighty Yankees and play in three straight World Series. In fact, when Mack was asked who his most valuable player was, the man who managed such legends as Home Run Baker, Eddie Plank, Lefty Grove, Jimmie Foxx, and Mickey Cochrane responded wistfully, “If I could only have nine players named Al Simmons.” Bucketfoot Al died in 1956 at the age of 54. Dave Philley ended his 18-year big-league career as a pinch-hitting specialist with the 1962 Red Sox ball club. He did not do very well. He was just just 4-28 that season for Boston in that role but he had a pretty good excuse. This switch-hitting native of Paris, Texas turned 42 years-old that year and everything about his game was slowing down. Twenty one years had passed since he made his big league debut as a White Sox outfielder in 1941. He would spend three years serving in the military during WWII before he’d get another big league at bat. When he returned, he evolved into one of the game’s better defensive outfielders, known for a very strong throwing arm. He was a starter in the White Sox outfield for five straight seasons and then with the Phillies for three more. As he aged, he did less starting and more pinch-hitting. 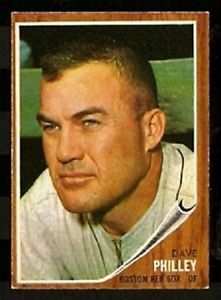 He still holds the big league record for most consecutive pinch hits with nine and his 24 pinch hits as an Oriole in 1961 is still the American League single-season record in that category. When he retired, he had an overall lifetime batting average of .270 and a career pinch-hitting average of .299. He died in 2012, at the age of 91. 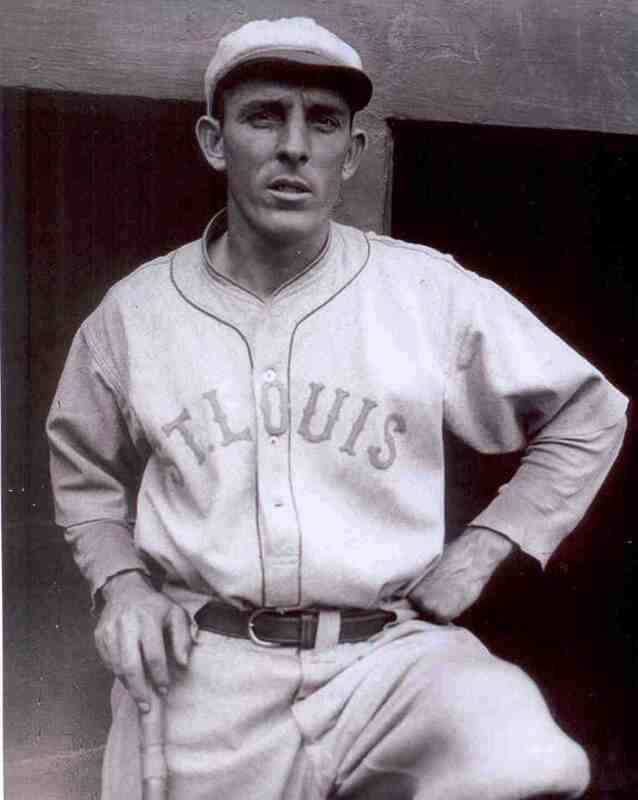 Johnny Tobin was a 5’8″, 142-pound little dynamo of an outfielder, who was also one of the best drag-bunters in baseball history.He was born in St. Louis and began his professional baseball career there, when the St. Louis Terriers of the upstart Federal League signed him in 1913. 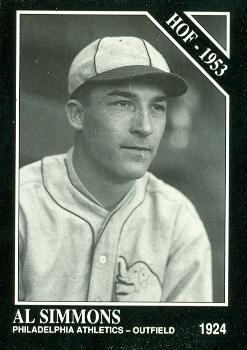 Tobin led the new league in hits during its second and final year of operation and he caught the attention of the cross-town Browns. He then spent most of the next decade starting in that team’s outfield after the Federal League went belly-up in 1915. By 1924, however, Tobin was approaching his mid-thirties and slowing down a bit at the plate. The Browns traded him to the Senators for two starting pitchers. He didn’t last long in our Nations’ Capital. He started out slowly at the plate for manager Bucky Harris’s Washington ball club. After 27 games he was hitting just .212 and was put on waivers. Tobin was prepared to retire and return to St. Louis, where he had just invested in his own car dealership. That’s when the Red Sox came calling and offered him a starting spot in their outfield. After thinking about it a couple of weeks, Tobin decided to accept it and when he went 3-5 with 4 RBIs in his first game with his new team, it was his way of showing Harris, the Senators and his hometown Browns who had also not offered him a job, that he was far from through as a player. Of course, the 1926 Red Sox team he joined and the ’27 club he finished his big league career with were two of the worst teams in Boston franchise history. Even so, Tobin leading that ball club with a .310 batting average during his only full year with Boston, when he was 35 years old was quite an accomplishment. Tobin retired with 1,906 career hits and a .309 lifetime batting average. He eventually became a coach for the Browns and then one of baseball’s first-ever bunting instructors. He lived until the age of 77, passing away in 1969. 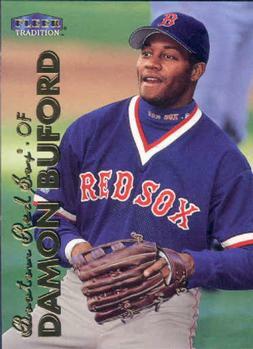 He shares his birthday with a more recent Red Sox, pitcher Ryan Dempster. This L.A.-born outfielder was a key cog in two of the most productive lineups ever fielded by the Boston Red Sox. 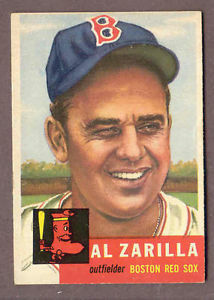 Al Zarilla got his start as a professional baseball player during the Great Depression, when he was signed at the age of nineteen, by the old St. Louis Browns in 1938. It took him five years and quite a few hitting adjustments to make the big leagues, but once he did, he helped the Browns reach the World Series in 1944 for just the second time in the franchise’s history. His best season as a Brown took place in 1948, when he hit a career high .329 and made his only All Star team. After he got off to a slow start the following season and the struggling Brown organization needed cash, Zarilla was traded to the Red Sox for outfielder Stan Spence and over 100,000 of Tom Yawkey’s dollars. He then took over as Boston’s starting right-fielder and hit .281 for a Red Sox team that was edged out for the AL Pennant on the final day of the 1949 season by the Yankees. In fact, it was Zarilla diving catch attempt of Jerry Coleman’s bloop fly ball to shallow right in the eighth inning of that season’s final game, that came up inches short permitting three decisive runs to score for New York. As good as Boston’s offense was in 1949 it was even better the following year when they scored 1,027 runs, which was over 100 more than any other team in the league scored that season. Zarilla accounted for 92 of those runs himself plus averaged .325. The lowest batting average of any Boston starting position player that season was Bobby Doerr’s .294! And still the Red Sox finished second to a Yankee team that featured the best starting rotation in all of baseball. After losing two straight pennants despite all that great hitting, it seemed clear to the team’s front office that they could part with some of their offense to acquire better starting pitching. Since the Red Sox had super-sub Billy Goodman available to play the outfield, Zarilla was the player traded to the White Sox in December of 1950 in a deal that brought two White Sox starters, Ray Scarborough and Bill Wight to Fenway. “Zeke” Zarilla did get to return to Beantown in 1953 and ended his big league career as a Red Sox spare outfielder and pinch-hitter in 1954. He later became a scout for the A’s and the Reds before retiring to Hawaii, where he died of dancer in 1996, at the age of 77.